The AWEX EMI increased by 16c to close the week at 1566c at auction sales in Australia this week. With 38,103 bales on offer, there was sense of urgency to complete orders for the months shipping deadline, hence the 96.7% clearance. The market opened with certainty with immediate rises in the merino MPG’s. The lower style and specified lots were keenly sought as buyers were looking to secure volume in this upward trend pressuring the MPG’s to rise between 18 and 66c in the Northern region. The sub 19.5µ lots all posted 30-60c increases whilst the medium micron categories experienced 2-18c rises. Skirtings posted 20-40 rises in line with the fleece, with extreme support on the odd finer lots of best style and specifications, I expect as fleece substitutions. Crossbreds continued to defy any positive signals that the merino market is emitting, with falls of 5-35c across the entire XB MPG range with the 32 MPG the exception. The carding market continued to push upward with the Merino Carding indices closing up 25 and 26 respectively in Sydney and Melbourne with Fremantle being the odd one out adding just 8c. 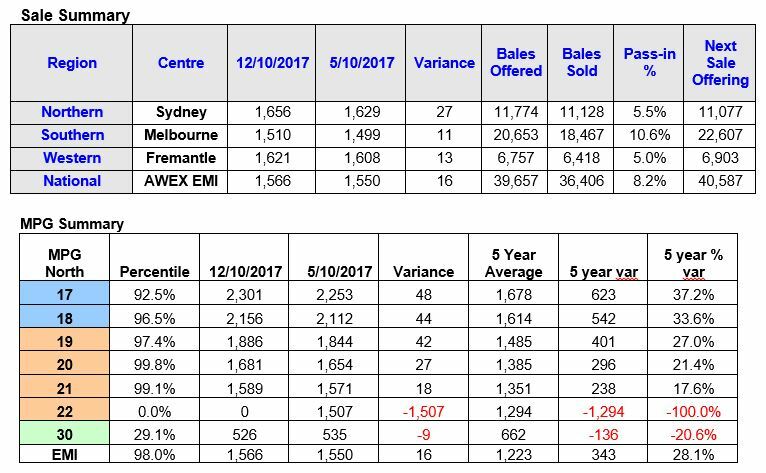 Next week’s offering pushes up to 46,512 bales to be offered nationally and is a designated Australian Superfine Sale in Sydney. Mike Avery from Southern Aurora Wool reports Forward markets traded strongly buoyed by continued strength in the spot auction. 18.5 microns forwards pushed into new highs, trading at 2000c in November, 1955c in January and 1950c in April. The forward curve has flattened on all micron groups with merino qualities all showing spot prices of an excess of the 90th percentile. Volumes improved marginally this week with 74 tons traded. This represents only 1.6% of the underlying auction through put this week. With prices at record, spring levels growers are yet to embrace the value of certainty over the fear of lost opportunity. Too much emphasis is being placed on the backwardation of forward curve and not on the absolute price being offered both pre-Christmas and into the New Year. In dollar terms per bale, autumn forwards represent 18.5 micron at $2400, 19.0 micron $2200 and 21.0 at $1900. Pre-Christmas levels are around 2% premium to these levels.